First week of the NFL Season starts tomorrow!!! Tuesday we had 2 plays. Our 1 unit play on Phil +150 won 4-3 and our 1/2 play on San Diego +149 lost 1-5. Four out of 5 moved our way with the other a slight move against us! How would you like to know which way the line was going to move before betting the game!!! These Big Line Moves have been very predictive of the move. Today I have sent our 3 one unit plays along with 4 Big Line Move Games. All plays in all sports I cover during your subscription. Access to me via email for any opinion you want on any games you’re looking at . I handicap almost every game and have up to date numbers and variables I look at. 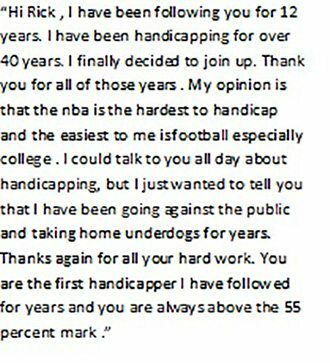 This for me is the best time of the year for handicapping sports. Football has always been my favorite sport to handicap. Take a look at the subscriptions available under the PayPal menu. All have a 3-day free trial. 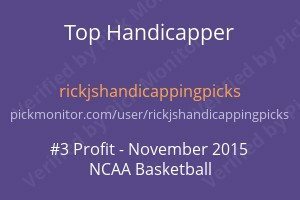 I can say without hesitation that RickJ’s Handicapping Picks is one of the best values for services around today. Most charge much more and require a lump sum for each sport for the season. Again the cost is many times our small subscription, also, I match my results against any for consistency positive EV and finally drawdowns. Hope to see you join us for a fun football season. Finally, If you are interested in the Westgate “Super Contest” and live out of Las Vegas, you need a proxy to make your weekly picks for you. I recommend “lasvegascontestproxy.com“. I get no remuneration for this, but know the owner (larry k) personally & he is one of the best in the business. He is also a proxy for All the contests in Las Vegas.